I love Hanukkah: the presents, wintertime, dreidels, candle lighting. I love all of it. I was born on the fourth day of Hanukkah (28th of Kislev), which makes the holiday particularly special. I lament the beginning of the month of Tevet because it signals the coming end of that special time and the return to normal life. As a semi-celebratory day, Rosh Hodesh (the beginning of the new month) seemed just as perfunctory as Tevet. It is a time that is marked but not especially noteworthy. Two years ago, however, Rosh Hodesh Tevet completely changed my relationship with that time of the year. On that two-day Rosh Hodesh, I lost a woman who shaped my practice of Judaism, and also discovered new women Jewish heroes who would inject Rosh Hodesh with a newfound importance for me. In December 2009, I went on a winter break program to study modern Israeli literature and religion with students and professors from my college. The best part was being able to spend Hanukkah in Israel. One of the people we spoke to on the trip was Anat Hoffman, executive director of the advocacy group Israel Religious Action Center and the leader of a protest movement called Women of the Wall. She told us about how religious customs function as de facto law in Israel, reducing the rights of women and non-Orthodox Jews. 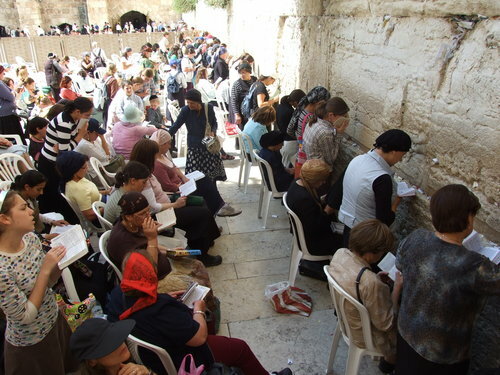 Women of the Wall organizes groups of women to pray on the women’s side of the Western Wall every Rosh Hodesh. There, many of the women read Torah and wear kippot, talitot and tefillin, even though the holiest site in Judaism forbids women from praying in any way that could resemble a man. Much of what Hoffman said surprised me—this was not the Israel that I grew up learning about that welcomed all Jews with open arms. To me, the Kotel seemed like a solemn place where all Jews could come together to worship at the spot that united Jews for more than 2,000 years in their longing to return. With two days left in Israel, I got a call from home—my grandmother had unexpectedly died. It was 30th of Kislev but the news made it feel like time had stopped. Her condition had been deteriorating since the summer. Nevertheless, her death was a shock. The next day, Hoffman suggested that we attend the next Women of the Wall gathering on the first of Tevet. Like many of the other students, I felt both apprehensive and a bit energized about encountering the situation. I had already been to the Kotel a few times on the trip to respectfully worship. Now, I was returning, in a way, to denounce those who worship there. It almost seemed wrong to disrespect such a holy place, especially since my family was beginning a burial and mourning process that was meant to convey deference to God’s master plan. But somehow it still felt like the right thing to do for her. My grandma was perhaps the biggest religious force in my family. She insisted on keeping a kosher home and having her children and grandchildren attend Jewish day school because she believed the structure was necessary to keep future generations practicing Judaism. She was also far from a Lubavitcher rebbe. She was a sophisticated, ardent liberal who lived in a secular world. She was continually abreast with the latest political developments or art exhibits. While embracing the structure of Jewish tradition, she could also be very combative toward anything she did not approve of. She always fought for what she believed. As a Conservative Jew, she believed that all Jews had the right to practice religion as they desired. At her funeral, the rabbi of the synagogue praised her for doing something rare today: raising a family committed to observance of Jewish tradition while avoiding any sort of fanaticism. That Friday morning, the first of Tevet, a cold, relentless rain fell on Jerusalem. We were already soaked as our group walked up the hills into the Old City. The women in our group went into the women’s section and joined a larger group under a colorful array of umbrellas that hid a Torah underneath. Although it was too wet for the women to read from the Torah that morning, Orthodox men on the other side were still outraged by their presence and began yelling “Asur” (“forbidden”), throwing things at them and calling them transvestites and other derogatory words. Shockingly, this seems tame compared to what recently happened to an eight-year old girl. Ultra-Orthodox men are forbidden from hearing women sing, especially while praying, because it will be a distraction to their religious devotion. That day it was the opposite. The men were so disruptive that I was unable to focus on praying for my grandmother over on the men’s side. Police separated the enraged men from the women who did their best to drown out all of the haranguing directed at them. I still cannot believe what I witnessed in what seemed like such a hallowed place—my grandmother would have been outraged. Supporting Women of the Wall was my way of continuing my family’s tradition. This year, Rosh Hodesh Tevet fell on my birthday, meaning that I would honor my grandmother by saying Kaddish as I began a new year of my life. It’s easy to celebrate a new year but celebrating a new month was more difficult for me to understand until I encountered Women of the Wall demonstrating the true spirit of Rosh Hodesh. Rosh Hodesh is meant to be a shake-up from the laws of the status quo in hopes of provoking a more righteous month to come.